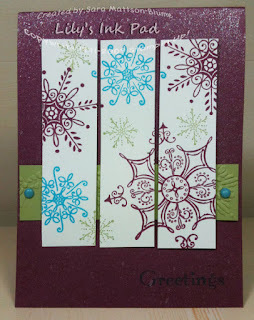 Lily's Ink Pad: Christmas On My Mind--Snowflakes in my Heart! The picture isn't the greatest, as I only have my iphone currently, so the Vanilla Smooch on the Rich Razzleberry looks like rainwater. In person, it's sparkly. I love this color combination as it takes my three faves and puts them all together! How fun! For the sentiment, I used a Tempting Turquoise marker and just colored the Greetings so I got the right sized sentiment on the front. A little fun that fits the card to me. The Pear Pizzaz piece seemed boring until I ran it through the Northern Flurry Folder. That little bit of texture just made me happy! 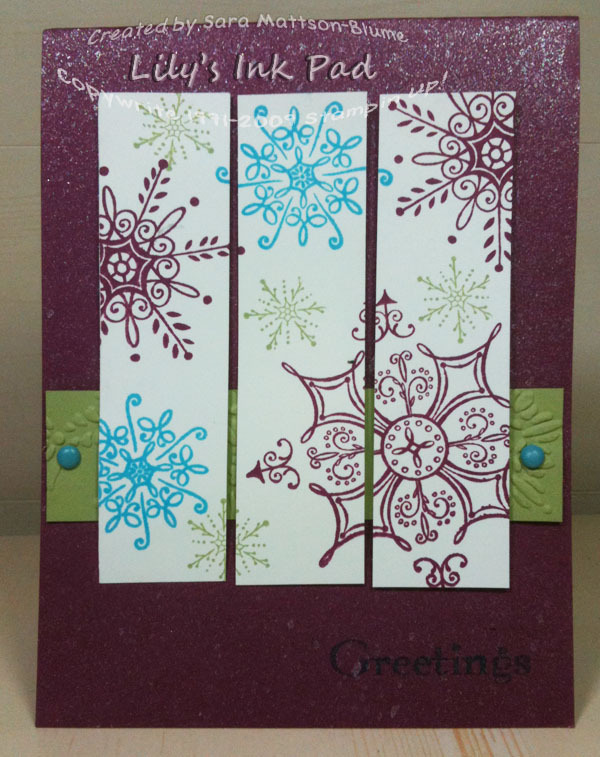 If you want to make this card, join me at Christmas Club this week! So pretty!! Those colors are amazing together!! Sara, this is so lovely! I never would have come up with that color combo--especially for Christmas--but it's terrific! No, no, no! No wishing for snow! lol! Lovely colors on your card...perfect for the sketch! You did an AMAZING job with the sketch! You are one talented lady! I absolutely love the vibrant colors. woo hoo! Just fabulous Dahling1 Just fabulous! Wow love this card the colors rock!!! Great card!! What a fun color combo!!!!! I'll have to keep this one in mind for future color inspiration challenges! Thanks for playing along with the Stamping 411. Love the color combo!! And I am not ready for the snow yet but I love your card!! Thanks for playing along with us this week!! Great card and color combo!